ruthdelacruz | Travel and Lifestyle Blog : Thank God There is T.G.I.Friday's Kiddie League! Thank God There is T.G.I.Friday's Kiddie League! TGIF reminds me of my wild college years. My ladies and posse love every TGIF's branch. I could say this is our favorite place to hang out. I so miss the old store in EL Pueblo.. This is where we hone our talent in smoking, where we mastered the art of flirting (haha) and where we introduced alcohol in our system. I remember one time, we went straight to the bar from school in our uniform, and the bartender refuses to serve us alcohol. But thanks to the Long Island Iced Tea - the tom collins glass conceals the amount of alcohol we had consumed that night. It saddens me to know some of the old TGIF stores had closed out, but TGIF will always be TGIF. I even once dreamt of working as a bartender for this bar. I always thought the work is so glamorous. Silly! This sounds like fun! I wish I were younger, or probably have a kid of my own, or better yet have my nephew and nieces here in Manila. Level M4, Trinoma, North Avenue cor. EDSA, Quezon City. Hope kids would also get those fun dorky hats! 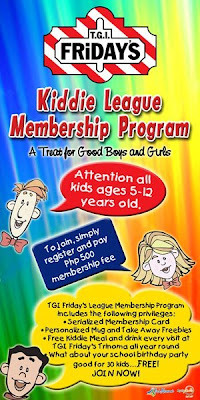 © ruthdelacruz | Travel and Lifestyle Blog : Thank God There is T.G.I.Friday's Kiddie League!